High oxidation stability — Long service life in high pressure service. Protection against rust and corrosion — Gives excellent protection against corrosion of both copper and steel. Passes the ASTM D665A distilled water rust test and ASTM D665B salt water rust test. High viscosity index — Minimum change in viscosity over a wide range of operating temperatures. 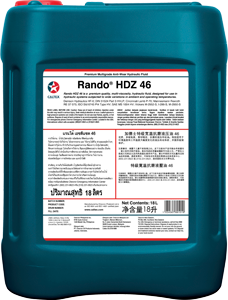 Rando HDZ oils incorporate antiwear additives, oxidation and corrosion inhibitors, foam and aeration suppressants, and a shear stable viscosity index improver.